Axis Apartments on Lexington Road to bring density with 300 new residences, but where’s the street life? 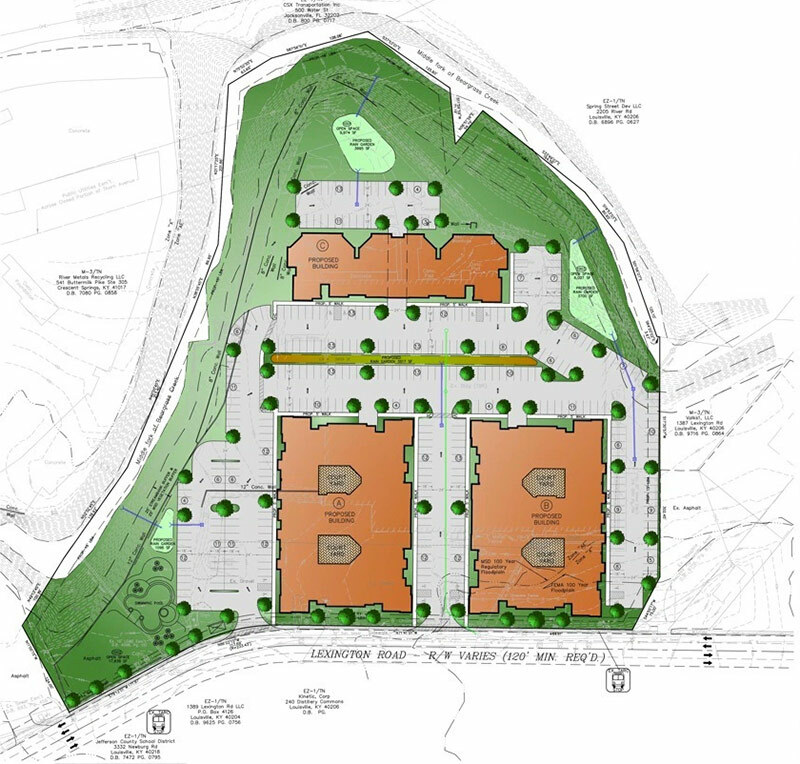 One of the largest urban apartment complexes proposed recently in Louisville is in the Irish Hill neighborhood sites between Lexington Road and Beargrass Creek. 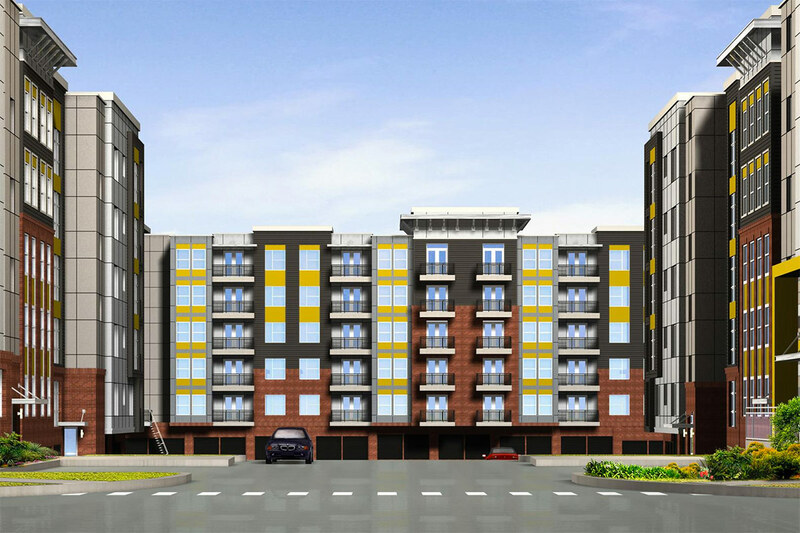 The so-called Axis Apartments are being spearheaded by Indianapolis-based developers Cityscape Residential. With 300 units on nine acres, the $45 million Axis packs a serious punch of density. Developers hope the project will be a “bridge” between the already hot neighborhoods of Nulu and the Highlands according to a report by Business First‘s Marty Finley. The project recently broke ground with an updated design. The Axis is across the street from Headliners Music Hall just west of Distillery Commons, a collection of the remaining warehouses from the Kentucky Distillery and Nelson Distillery. Plans were announced two years ago to convert one of those warehouses into another 100 apartments called the Barrel House Lofts. Sources tell Broken Sidewalk those plans are no longer in the works. The Axis is comprised of three, five-story buildings designed by Dallas-based Humphreys & Partners Architects. That firm also designed the Bellamy Student Housing apartments near the University of Louisville. The updated design brings bright yellow accents in the brick and concrete-fiberboard design. Out of town developers have been using pops of color in their projects, such as the bright teal on Frankfort Avenue’s AMP Apartments. 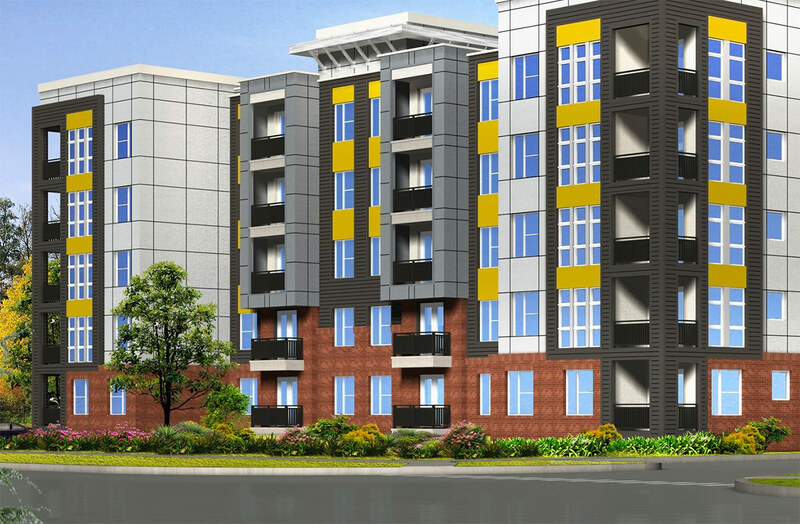 The locally developed 310 at Nulu features a similar material palette. Apartments at the Axis will range from $800 for a 600-square foot studio to a $1,600 for a 1,350 two-bedroom unit, according to Finley. The units are expected to be high-end with the typical finished for a Louisville high-end apartment: stainless steel, wood floors, nice cabinets, and top-of-the-line counters. In a strange marketing technique, Finley wrote that “Cityscape will offer a swanky amenities package more often seen in a suburban setting.” Typically, the urban qualities of a project are the selling point. Those amenities include a saltwater pool, a pet spa and dog park, bike parking and maintenance areas, among others. Finley reported that developers expect many of its tenants will bike as a regular mode of transportation. And timing appears right for an influx of cyclists. Sources told Broken Sidewalk that plans for a protected bike lane proposed along Lexington Road have been scrapped, but that the city is still planning to install regular bike lanes along the stretch. The Axis is urban in many of its design respects, chief among them that two new structures will be built to Lexington Road, creating an urban edge that will help to visually define the corridor. Despite this gesture, the project lacks retail and, beyond adding density and the potential for people walking, will not contribute actively to the life the street. This could potentially cement the character of Lexington Road as a through-street and not a stopping street, making the Axis and the area around it essentially a bedroom community to more vibrant neighborhoods. In 2009, a design competition called Mediative Urbanisms for the Axis site and another adjacent parcel received proposals from around the world. The winning proposal came from a team from Paris, France, and called for a mix of residences, retail, and cultural space organized around a park along Beargrass Creek. That competition design was never meant to be built, rather offer ideas on how to redevelop the long-vacant site after a strip mall proposed by Louisville-based Poe Companies fell through. Cityscape expects the first 30 apartments to be complete by the end of 2016, with the rest of the complex opening in the second half of 2017. Leasing could begin next summer. 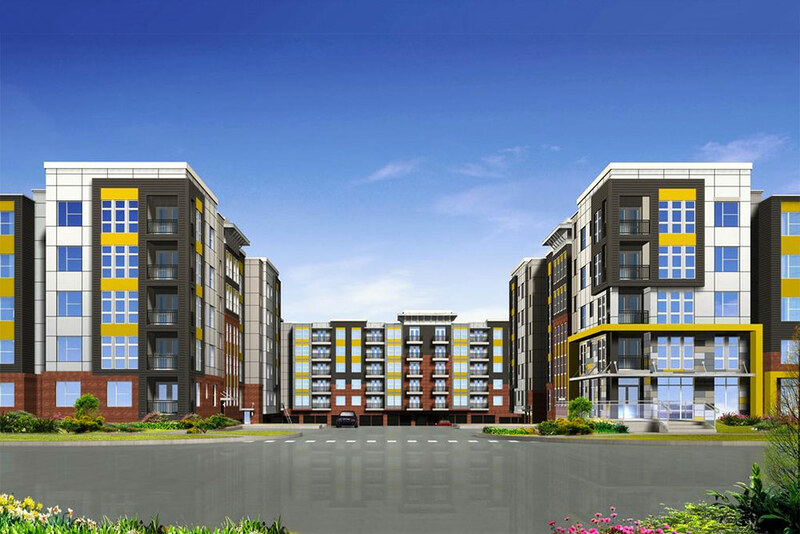 Cityscape also developed the 312-unit, $30 million Apex on Preston out in the suburbs. That complex sits on 15 acres off Preston Highway all the way at the county line. Construction is expected to be finished in December. Developers teased that they have a third apartment complex lined up for Louisville, but that a site has not yet been determined. The density is great – but those things are going to look dated before they even get finished building them. Wow. I don’t know about anyone else, but there is no way I would pay $800 a month to live in a studio apartment. And for $1600 a month, you can rent a HOUSE. A nice house, closer to the bars and restaurants. I don’t think “hip” trumps affordable rent. Well changing Lexington road is the worst idea every and because they are building this I am actually moving and going to rent my house out that is less than 5000 feet down the street so if you a whole house for 1100$ give me a call! This design is so lazy. Sadly, it brought back to mind that Louisville is always tripping over itself and its potential. City of the 70s, in perpetuity it appears. This looks just like the trendy stuff being erected in Nashville along Broadway and primarily in the area they call the Gulch. Everyone who lives there, is very happy with them. I was just there this weekend, I think they are ugly, I think these apartments are also ugly. But they are very popular with young people. I am glad to see Louisville beginning to follow some of the national trends, despite individuals who want everything to look like it’s from the 1890’s. In addition, Lexington road is already little more than a through street in that area already, so I doubt that we should balk at improving the area; because it doesn’t make it any more or less walk-able than it already is. The area currently is a great big nothing, with headliners at its center. The yellow/gold color is overwhelming in the design. Looks like a lot of what is being built here in Culver City, CA around the Expo train line. It’s really difficult to imagine how this type of construction will age; the materials look cheap, and the designs appear recycled and deaf to the surroundings. I like the modern sensibility of this trending aesthetic, but it requires sound execution in design, planning, and construction. Developers are eager to jump into Louisville, Nashville, Columbus, etc and throw these copy-paste urban developments up as fast as possible to capitalize on the momentary demand, but once these things are built and the market saturates, it’s what we have for decades to come. Will we be fighting to preserve this complex in 100 years? Will that scary yellow paneling survive 100 years? I can’t wait to find out. The renderings in this older post are out of date. Check out the latest article here (http://brokensidewalk.com/2016/axis-apartments-construction-2/) to see the current rendering. Thanks Branden, the updated rendering is much improved. There are many examples I’ve seen here in LA where the colored panels are used quite effectively and do not cheapen the look of a design, but I think this facade is much more handsome when the blocks of yellow are removed. This is a nightmare for those who live around the complex. Already thick traffic especially at rush hours both early and late. Mosquitoes and raccoons and opossums come up the hill from Beargrass Creek. With the music venue across the street, you will have about 100 cars trying to find a parking space for a concert. There is an elementary school around the corner with lots of little kids in the park on the corner. If you check into area crime you will see that we have alot of car breakins. This was not the sharpest idea in the developers pencil box. That’s my opinion. By the way I live in this neighborhood and know these things are true.